Today we’d like to introduce you to Joe Navarro. I started working for ARS (one of the biggest plumbing companies in Houston 2002). I worked there for 4 years. After leaving ARS I started working at Village Plumbing, amid Size Company for 5 years. After Village plumbing I started working for an owner who just started his own company. He was running his business from a garage at the time and his sales where about $400,000.00 a year. I helped him structure and grow his business for 5 years. After 5 years his company multiplied 4 x in sales. Just about 1.2 million when I left. I knew then I had the experience and knowledge to pursue my dream. My dream my goal was to one day run a GREAT company. Working for the 3 companies taught me how to run a business. I picked up great ideas through my journey and incorporated them into my business. I groomed myself to the position of CEO and Owner of Texans Water Heaters. The real reason I wanted to start my own company was not to get rich. It was to have more time with my family. I always said if I get rich while doing what I love then it’s just a bonus. Three years later we are a 5 star rated company throughout the internet, (Best of 2017 Home Advisor, Angies List Super Service award winner, 5 star on google, Facebook, yelp, and BBB. I have 4 employees and looking to expand this year before the fall. I am married. My wife name is Brandy Navarro who inspired me to start the business. I have a son Joseph Navarro who is 2 1/2. Business has been great! We sold our house and moved into a better neighborhood. We could have chosen to live in another part of town or community but we stayed here 77433 because it has been so good to my business and we love our community. About 65% of our jobs come from this community. We are a Christian company that gives back to the community and proud sponsors of YAY 4LIFE a cancer charity. Last December we started a new tradition, of giving away a free water heater with installation to a family in need. The hardest obstacle was finding the right employees, I knew from my past experience that finding the right people would take time. It took me a few months and a lot of training to get my company where it is now. My employees are well trained and skilled and background checked. 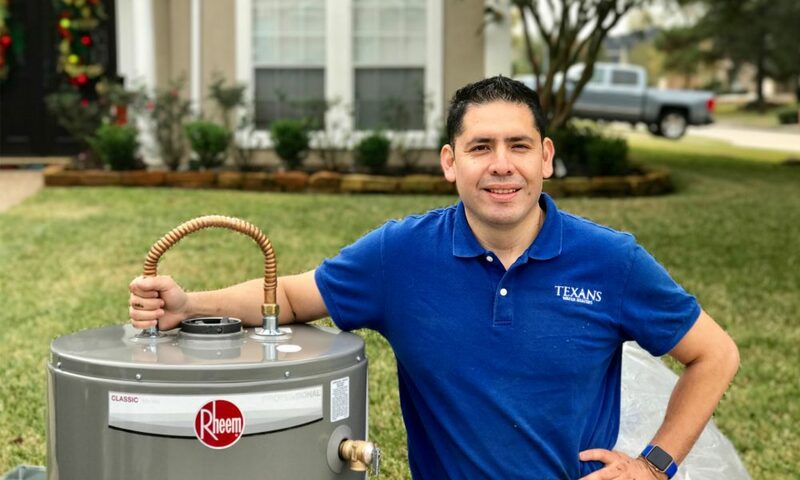 So let’s switch gears a bit and go into the Texans Water Heaters story. Tell us more about the business. We are a plumbing company that specialize in water heater installation (retrofit). We replace old water heaters. There is no one in Houston that know more about water heaters than we do. We are a 5 star rated company all over the internet. We give back to the community! We will be the leading plumbing company in Houston and Cypress that specializes in water heaters. Fast service and upfront prices. Full transparency and our customers will be able to order a water heater online like they would a pizza. Tankless water heaters will be the way of the future. They will be affordable for all homes and tank type heaters will soon be obsolete.